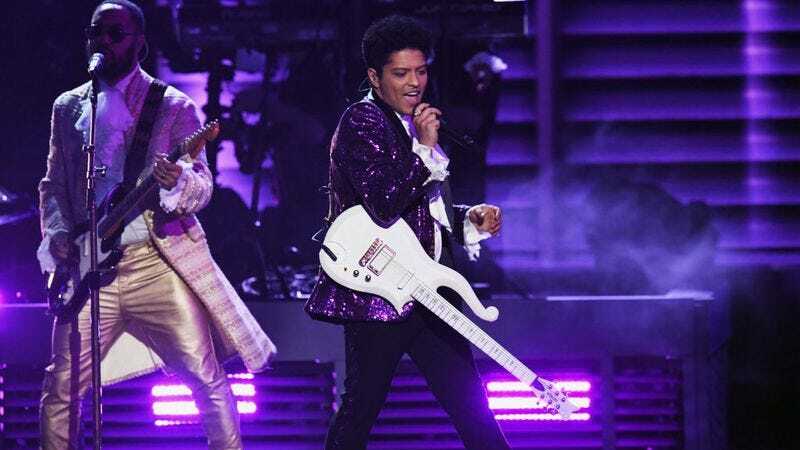 If Beyoncé’s Grammys performance was regal, Adele’s was solemn and respectful, and Lady Gaga and Metallica’s was kind of weird and loud, the Prince tribute from Bruno Mars and The Time was straight-up funky. The Time came out alone first, getting the audience pumped up and dancing, and then Bruno Mars stepped up in a sparkly purple suit and puffy shirt to do his best Prince impression on a cover of “Let’s Go Crazy.” Everybody in the audience was going crazy, Beyoncé was singing along, and it was clear that the show had suddenly transformed into a pretty sweet party—and that was before Mars broke into an appropriately suggestive guitar solo that probably would’ve made Prince proud. You can see clips from the performance below.